Discussion in 'Z3 Roadster & Coupé' started by joeshark, Aug 21, 2014. I'm pretty new to bmw, had a 320 coupe back in the day, i've wanted a bmw again for some time, so am now looking to purchase a used z3. I've got two prospects at the moment that are near me. One is a '00 2.3 with 103k miles Looks excellent condition, & supposedly in excellent condition, asking $6400. The '00 is a little out of my price range, but may be the better car overall. The 4cyl might suit my driving & gas sipping needs a little better, though the gas savings really isn't a deal breaker at all. I'm posting a couple of photos. Any advice as to what I should look for, that could help me spot something I should run from? Hi Joe, mine is a 2000 2.0 Auto so I can't offer too much on a 2.3 as they weren't available here in the UK. The 1.9 will most likely be an M44 and there are lot's of owners on here with these cars so I'm sure someone will be here soon with help for you. The 1.9 looks like a good bet to me as it looks nice and clean and should be an M44 16 valve block, as Tony said, but I am not sure how that worked in the States, as the 1.8 was (for some reason) also sold as a 1.9 at one point. And the owner could not even get that right!!! HI Joe, I have a 98 2.8L six that I purchased about 2 years ago with 98k miles on the clock. Payed 7 thousand for it and would do it again in a heart beat. If anything sometimes I feel I would be even happier with the extra horse power that an M would bring, but very, very happy with the non M.
Never driven the 4 cylinder so can opine as to the horsepower differences. Does that mean the sticker on the rear of mine means I must be Grumpy !! . Cheers for that Joe, Mike is a little monkey. I'm in Lincoln, UK, where abouts are you stateside Joe? We have several members on your side of the pond, not least Frankie who made the trip over here earlier this summer, a top guy. Check out his videos of his time over here. Also Jim up there in Canada who recently got his car which was shipped over from the UK. I would run from the 2.3. It may have been driven befitting the M graphics covering its sides, and have broken subframe welds and drivetrain problems as a result. Drive both cars, work every control, and get as much history as you can. 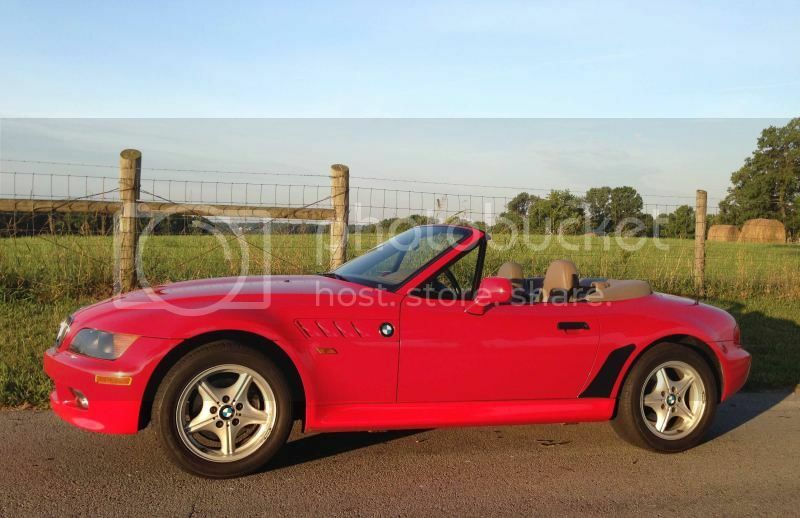 I would not buy a Z3 based on its price, but rather for its condition and history. For instance, two years ago I looked at an M, a 2.3 and a 1.9, all for twice your 1.9. I got the 1.9. Surely that would apply to buying any used car - re the "M" especially, it's likely to have been driven hard(er) , you don't by a dog and bark yourself? haha you guys are funny I'm NY t-tony it's a tough state to by a cherry car, especially in the city, the roads are crap. No those aren't stock wheels, but you shouldn't have too much trouble finding a set if you want to get shot of those. Yep so definitely can't go by pictures, as every one knows. Took the 1.9 for a spin, piece of junk, not worth $3k, if even that. Needs new top(sealed with tape), pretty dinged up and dents, either bushings or shocks needed for rear, possible shift pins needed, seat motor was pretty rough,etc.... . Also the guy is a sidewalk dealer(person who sells cars on the streets as opposed to actual dealership), which unfortunately there are plenty of here in NY. Checked out the M badged z3 today. Question, the owner(which is not an owner,but another street dealer), says the car came with the badging from the factory, is this possible? It has an M badge on the steering wheel & also on the back. Personally I think the guy is just being a salesman and making stuff up. The car looks pretty darn clean I must say, seems to drive nice and tight, motor is humming nicely & transmission is shifting good(it's automatic). One thing I did notice under the car was a small wet hose, looks like coming from radiator, but it is a small hose, maybe 1-2" around, maybe an A/C type of hose??? Saw also what looks like minor surface rust on the underside also, but i'd imagine this is pretty normal. All in all, shows & feels like a car of it's age. If he would go for maybe a $1k reduction in price, would probably be a good deal. Some BMW steering wheels did have an ///M badge on them from the factory (which normally makes people assume they either have and M Roadster or an "M Sport"). Those stickers on the side are nothing that BMW would ever apply to any car in any of their factories ever. I'm guessing they are vinyl, so should peel of without causing any damage. This particular guy is giving me a song & dance, I like the car. I don't like the fact that he's telling me he's not the owner, but a broker or something & that the original owner has already signed the title and he has it in hand, but I can't meet the owner :/ Fishy fishy, think i'm going to pass. I've got to check out one more, that looks promising & is being sold by an actual dealer. 97 2.8 Auto with 72k miles. Looks clean in the photos. SUPER SHARP CAR DRIVES NEW!!! The 2.8 engine is just as sharp mechanically as the others yes? Most 2.8 owners on here say it's the best one. I can't comment because mine is a 2.0. Hope you find what you are looking for Joe.